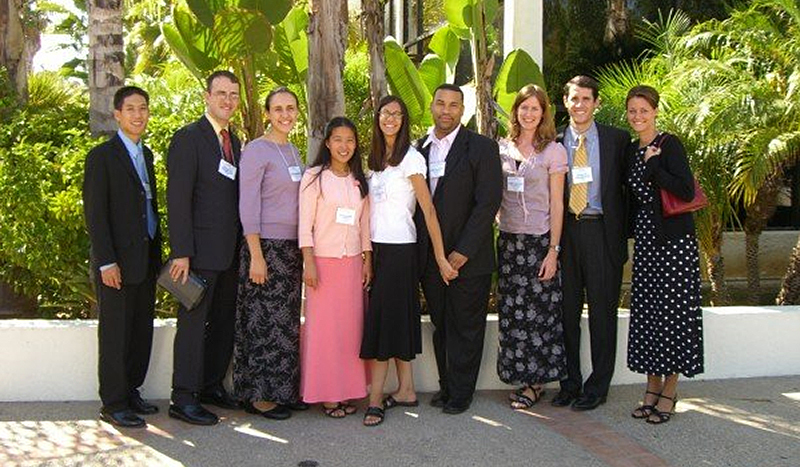 A group Loma Linda Medical Students who attended the 1st AMEN conference in San Diego California. The following is a transcript of an conversation between Dr. Naren James, a family physician in Stanford, Kentucky and the first president of AMEN and Mark Finley, an assistant to Elder Ted Wilson, the current president of the General Conference. In it they discuss the history of AMEN’s founding and their vision for the future. James: Elder Finley, it’s good to have you at the time of this recording. We’re in Cincinnati, Ohio, at the national ASI convention. This is somewhat symbolic because, 8 years ago, in year 2004 at the national ASI convention here in Cincinnati, we first had a gathering of 70 Adventist physicians and dentists and their spouses for a luncheon event. And indeed, as one of those who organized that luncheon, at least on my part, I thought, “Great, we’ll just do a luncheon.” But subsequent to that, you and I have had conversations and you were quite supportive of having a self-supporting organization. 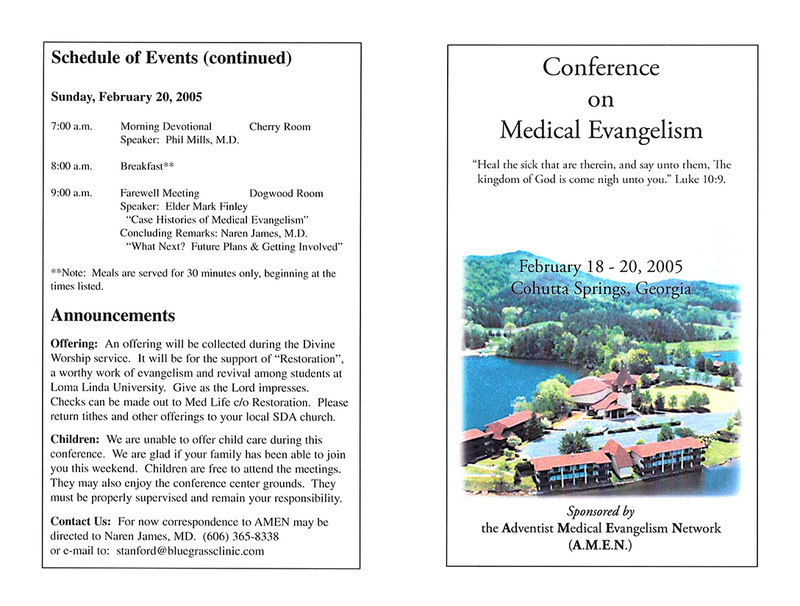 And so here we are today, 7 years later, as the Adventist Medical Evangelism Network. So I want to begin with asking you a straightforward question: Why do you support the concept of Seventh-Day Adventist physicians becoming organized as a self-supporting ministry within the Adventist church, now called the Adventist Medical Evangelism Network (AMEN)? Finley: Well, I remember those days Dr. James, and 7 years ago, a group of physicians had a dream to establish a network of physicians, dentists, and other medical personnel throughout North America and possibly the world. The reason I supported it then, and the reason I support it now, is because when you look at the life of Jesus, and you take a passage like Matthew 9:36-38, where Scripture says that Jesus went about all of the cities and villages of Galilee, teaching, preaching, and healing, Jesus was interested in the whole person—physical, mental, and spiritual. And often as Christ worked miracles, it opened doors for a divine, Biblical truth. I understood then, that Godly physicians, dentists, and medical personnel, had a deeper sense of the ministry of Christ. Because of this deeper sense burning in their hearts and minds, they wanted to sharpen their skills. They wanted a form in which they could discuss together what’s happening in their practices. They wanted to participate in overseas missions. I sense that this is in harmony with the ministry of Christ, with the holistic ministry, and also in harmony with the prophetic vision that Adventism was birthed in. And with that came a true revival in my medical practice. I was sufficiently impressed. I was sufficiently blessed that I felt impressed to share this with other health professionals. I felt a burden for fellow colleagues who weren’t experiencing that blessing. I was wondering, from your standpoint, how much of that entered your mind as you were thinking of Adventist health professionals who may have lost the vision of their initial calling in medical ministry? Finley: Let me give you a bit of my personal background. That might help to frame the answer to my question. I became a Seventh-Day Adventist in the early 1960s. I went on to Atlantic Union College. While I was at Atlantic Union College, I became in contact with Elman Folkenberg. In fact, my wife lived in the Folkenberg home as a student in college. At that time, Elder Folkenberg was working with Wayne McFarland to develop the five-day plan to stop smoking. I became acquainted with those Godly men and it’s quite amazing, the impact that either teachers or mentors have on you when you’re in college. Dr. McFarland began to talk to me about medical evangelism. He talked to me about things like the 5-day plan to stop smoking, and weight management programs, various kinds of cooking schools, and stress management. It really impacted me as a student. As I went out into ministry and the providence of God, I began to work in Hartford, Connecticut, with Dr. OJ Mills. Previously, OJ Mills had been the pastor before my time of the college church at AUC, but he had gone to Connecticut. He was a great medical evangelist—a great believer in the ministry of Christ, the Spirit of Prophecy, the writings of Ellen White. That impacted me. Throughout my ministry, in all of our evangelism, I went from Connecticut down to Wildwood, Georgia, a self-supporting school in medical evangelism—that impacted me, too. In my studies, I continued to focus on the holistic approach. We worked in the cities of New England. Rather than doing the traditional evangelistic approach for three weeks, we were going for six months with medical evangelistic teams. I saw the impact of that as I traveled to Europe. When we went to Moscow to work in the Olympic stadium, we had 100 medical personnel with us. We took 18,000 blood samples in a period of about two and a half weeks. We were taking thousands of blood pressures. I saw the impact of this all over the world. So, when you approached me and asked me for advice, God had been preparing me to be sensitive to gospel medical evangelism for decades. Right away, the idea struck me positively. So many Godly men and women are out there, working on their own. But if there was a network where they meet together, once a year for a seminar, opportunities to interchange will enhance what they are doing. It will inspire those that are not doing anything, and it will bring together a collegial group of Adventist medical professionals who are making a difference. James: That’s a great point to segue into our next question. Is there any special moment in AMEN’s history that you want to share with our physician and dentist members? Finley: There are two that really impacted me. The first is our first gathering. We couldn’t call it a conference, but it was an organizational meeting that took place. It was back in spring of 2005. In the spring of 2005, we met at Cohutta Springs. There were probably 35-40 people at most, including men, women and children. We met, planned, and visioned a medical conference. Bulletin from our first conference. I came away from that weekend believing God was going to do something significant with AMEN. I came away from that weekend believing. We prayed together, we dreamed together, we visioned together. We looked at the ministry and methods of Christ, as well as some of the statements in Spirit of Prophecy about medical evangelism. Although the group was small then, I came away feeling that God is going to do something. As we thought and prayed, we suggested that we’d provide scholarships for medical students at Loma Linda Medical University. Our meeting was going to be on the West Coast and we already had the rooms and the food. Rather than putting $20,000 into advertising, we thought we’d put that amount into bringing in forty extra students. We knew they would come, whereas with advertising we couldn’t be sure. And ultimately, it’s a better investment. Well, those students came, so excited and thrilled with what they heard. They went back to their campus and began spreading what they’d learned. At a recent AMEN convention, we had 100-150 medical students. At the last convention I attended a year or so ago, we had over 350-400 total people on Sabbath. As I look back at the history, from 35-40 at a meeting in Cohutta Springs to 350-400 in attendance, God has really blessed. What that has said to me is that there is a hunger in the hearts of physicians and dentists everywhere to get back to the heart of Jesus. There is a hunger to do everything they can in their practice to walk in the footsteps of Christ, the Great Physician. James: That’s quite amazing. That was one of the events that impacted me as well because, as I look back, it was truly a pivotal moment in the history of AMEN. You had the forward-thinking vision in thinking that we could make an impact—not just for that conference but for the future. Today as you and I look back, we see these medical students who are now graduates in the field. In fact, one of them are actually on the board of AMEN. Finley: It’s really exciting to see, 4-5 years later, students are now becoming a part of AMEN. I don’t have the exact figures, but I would be sure that in the last 6 years or so, we’ve had well over 200 medical students that we’ve sponsored. James: Yes, we’ve had dental students as well. I’ve sat on a nominating committee with graduates who are the very first batch. It’s quite impressive. Another question would be: would you like to share some ideas of how AMEN can be more effective in equipping its physicians and dentists to be medical evangelists in their professional setting? Finley: As we look at the unfolding of science today, more and more studies are documenting the value of physical, mental, and spiritual modalities in approaches to health. More and more medical schools have courses on spirituality and health. Of course, places like Duke University and the Center of Spirituality and Health have really spawned a lot of these studies. The John Templeton Organization has funded studies that have to do with the relationship of depression and church attendance, as it comes to mothers and their daughters. In the studies, mothers who attend church have daughters who are less depressed. When you look, for example, at studies on early mortality and those that relate to church attendance, you see that those who attend church tend to live longer. Studies on stress, Bible reading, and prayer. Studies on blood pressure, Bible reading, and prayer. Studies on religiosity. When you look at the plethora of studies that are done today, it really impacts you. If you do not include prayer, Bible study—if you don’t include some kind of Christ-centered approach in your practice—you’re not giving your patients everything that they need, not simply for eternity but for their quality of life and health here. There are some things that AMEN can do intentionally and constantly. Let me list three or four areas. Constantly refining the spiritual inventory process is critical. How do you take a spiritual inventory with patients? By spiritual inventory, I mean an inventory that is part of the process of health and healing. How do you help physicians and dentists become more articulate in communicating with their patients? When you get general practitioners and family medicine, they’re seeing maybe 20-30 patients a day. How can you be sensitive to those who are open to spiritual things? How can you build bridges to help them with the stresses and anxieties of their life? What can you do? That’s one area that AMEN can really work on. That is the interpersonal relationship of the physician with their patient, and how to build spiritual bridges. Secondly, how can your waiting room be a place of health and healing? What kind of DVDs could be available? What kind of literature could be made available? How can you set that place apart as holistic health? Thirdly, what kind of things can be done out of the office that facilitate the whole idea of prevention? Could you have a nurse on your staff who is a nurse Bible worker that does health Bible talks at night as part of the prescription? Could there be cooking classes that are part of the prescription for overweight, high blood pressure, high-cholesterol people? How can you develop a holistic medical practice in the 21st century? James: Absolutely. When I think about this engagement with AMEN, a large part of it is obviously driven by Spirit of Prophecy injunction, medical ministry, Ministry of Healing, Counsels on Diets and Foods. We as health professionals are blessed with a tremendous repository of information that was delivered to us over 150 years ago, and yet is so relevant to date. So we found our health professionals being energized and reviewing that information again. As I was reading the Spirit of Prophecy as the first president of AMEN, I was discovering statements inMinistry of Healing such as one I’ll paraphrase from chapter seven: “To the physician, equal with the gospel ministers, is entrusted the cure of souls.” I was pretty taken aback by that. I want to ask you, if we had an ideal situation where we implemented all the principles of Spirit of Prophecy into modern day medicine in terms of our own institutions, like our own dental practices and private practices, as well as our hospitals, how would you see that transforming the way our Seventh-Day Adventist healthcare is delivered? Battle Creek Sanitarium, in its best days, implemented the best of science. Kellogg was an eminent surgeon as well, but in addition to the surgery, he practiced rational therapies, exercise classes, hydrotherapy, and diet. And about 120 cereals came out of Battle Creek as well. All kinds of things came out. I think that, for a period, God anointed Battle Creek. It had people like John Jacob Aster, J.C. Penney, and many other royalty of Europe going there. God had His hand over that institution. I believe that, if Seventh-Day Adventists institutions blended the cutting edge of modern science and technology with the message of health that God has instructed to this church, and incorporated the principles of health…if we really probed the value of sunshine, fresh air, rest, a good diet, Bible study, and prayer, then God’s blessing would rest upon us and we would see miracles work for the kingdom of God. I think that those principles are being demonstrated and endorsed today by science. James: I think that recently, we as Seventh-Day Adventists have been reminded that we are way ahead, because people are now taking our message and moving ahead with it. I can think of a couple examples, such as Forks Over Knives and The Last Heart Attack, the latter being an interview with Bill Clinton and his decision to become a vegan because of his several heart attacks and blockages. Your segue into Kellogg brings me to a key question which would be of great interest to our physician and dentist members. Obviously, the Kellogg experiment unfortunately ended with a bitter taste between the ministry and the medical community. How do you see us rebuilding that bridge between the ministry community and the medical community, so that they are working together as was originally envisioned by our founding fathers? Finley: There were certainly multiple reasons why what happened with Dr. Kellogg happened. Not the least of them was the refusal on the part of some in the ministry to accept the principles of health reform. That was certainly one reason. Dr. Kellogg was a very brilliant personality. He was entrepreneurial in his thinking process. He saw the church moving slowly, and would have taken the medical work totally out of the hands of the church. He began to get involved in a variety of theological trends, specifically pantheism. So if you look at the Kellogg/church relationship, there is really no simple answer; it’s quite complex. But to answer your question directly, I think you’d have to build the bridge on a local level. I don’t think it can be done on a corporate level. No policy or program that can be initiated by the General Conference, Union, or local conference can establish that. I think it can be established in local congregations. First, pastors should not feel threatened by the physicians in their congregation. Secondly, there must be a mutual trust being developed between pastors and physicians. Where, together, they can sit down and plan and strategize, similar to what we did in AMEN. From a pastor’s perspective, there are some pastors that are quite threatened and intimidated by physicians. They see their education, their scientific background and training, some of these physicians are people of means, and the pastor may be a bit intimidated by that. Particularly if there is an age gap—there is a younger pastor and an older physician, or vice versa—there can be some tension there. One, that AMEN would have a medical conference in which pastors and physicians are both invited. In fact, I think there’s a plan for that. James: Yes, I’m pleased that you mentioned that because it will be next year, 2013, in Orlando. The goal is to get 50/50; for every physician or dentist to bring their pastor with them. That is something that will hopefully achieve that you are talking about. I think, as physicians and pastors meet and pray together, walls of prejudice are broken down and relationships are developed. What I found in my ministry as I look back on the past 45+ years, if you develop Christ-centered relationships with people, you’ll accomplish so much more than distant relationships. I remember an experience I had when I was in a small church in Connecticut—we had 28 members in my church. It was my first pastoral district. I knew that we had to do something for Christ. We were going to launch a major medical missionary thrust. We would meet at my home, with the key leaders of our church, one of whom was a physician. We would pray together, study together, vision together, dream together. I think that becomes critical in a pastor ministry alliance: building trusting relationships through prayer and studying, and then beginning to implement small plans, until you develop a medical missionary strategy. James: It sounds like it can be basically encapsulated by a pastor in his pastoral capacity, and a physician in his professional capacity, learning how they can complement each other. I found that to be successful in my professional setting. We’re down to the last two questions for this segment, Elder Finley. The one that I wanted to get across to you is, in your opinion, how much has AMEN impacted medical missionary work in the Seventh-Day Adventist church in America and abroad? Finley: AMEN impacts people. When you impact people, you impact conferences, unions, and divisions. So first, AMEN is impacting physicians that are making a difference in their local practice. But second, the fact that AMEN has an organization that has raised the profile of medical missionary work throughout the division and the world…other chapters are beginning to form. There’s a chapter forming in Nigeria, and there’s interest in England and Australia. AMEN has lifted the profile of medical missionary evangelism around the world. I’ll give you another practical example. I was sitting in a meeting with the General Conference president, the top officers of the General Conference, and the division presidents. It was a Sabbath morning and Elder Israel Leito received a phone call that there was a massive earthquake in Haiti. He announced it to our group. The earthquake had taken place shortly before that time, and he gave a report of that earthquake. Total devastation. He said, “We don’t need people to go in—that’s the last thing we need—because we’ve got to organize. But if we could have medical personnel, that’s what we need desperately.” I made a phone call to my daughter Rebecca, who was and is still serving at AMEN. She contacted the then-president Phil Mills, and they organized a consortium of AMEN and others. 100 people went. Doctors, dentists, nurses. Obviously, when you go into a disaster zone, there are some hiccups and difficulties, but that trip made an impact. So, I would like to say to you, on behalf of the Seventh-Day Adventists, thank you and thank AMEN for what you are doing, both in your overseas mission trips and your work in the United States, to make such a difference for Christ. James: We’re down to our very last question. Can you share your vision for medical missionary work in these last days across the church? And how do you see AMEN being an integral part of that mission? Finley: In Ezekiel 47, the Bible talks about a river that flows from the very throne of God. It says that the river is a little stream, and it gets deeper and wider. Pretty soon, there are plants and trees growing all along that river; they’re producing fruit and the whole land is flourishing. Ellen White takes that vision and she sees it as a symbol of medical missionary work. The river begins to flow, broadens, and deepens. Revelation 18:1 says that the whole earth will be lightened with the glory of God. Ellen White says that when the cities are worked with medical ministry as God would have them, the result will be the setting in of a mighty movement, the likes of which we have not seen. She also says that soon, we will come to a time that no work will be done among us except for medical missionary work. What is medical missionary work? Somebody may say, “I don’t have a medical degree, and I’m not a missionary.” Medical missionary work is the loving service of Christ. It is the selfless, sacrificial service of Christ that meets needs everywhere in order to bring glory and honor to Him as we share His love with others. What’s the future of medical missionary work? It’s bright. It’s as bright as the promises of God. Because Christ, the great Medical Missionary, is leading His church to an experience with Him, in which self will be broken and our hearts will reach out in selfless service to others, for the glory of His name. Dr. Naren James is currently a family physician in Stanford, Kentucky. He had the privilege of serving as the first president of AMEN and currently serving as the president of Life and Health Network, which is an affiliate media ministry AMEN. Dr. James earned his medical degree from Montemorelos University and completed his internship and residency at St. Joseph Medical Center in Reading, PA, affiliated with Penn State University. He also completed a fellowship in obstetrics affiliated with the University of Washington School of Medicine in Spokane, WA. He is a member of the Kentucky Medical Association, a fellow of the American Academy of Family Physicians, and is board certified in family medicine. Elder Mark Finley is the media vice president for evangelism at the General Conference of Seventh-Day Adventists, and is currently serving as an assistant to Elder Ted Wilson, the current president of the General Conference.